Ingredients: vegan chicken patty, red pepper, broccoli, bamboo shoot, ginger. Seasoning: black bean soy sauce, sugar, chef’s delight vegan seasoning. 1. 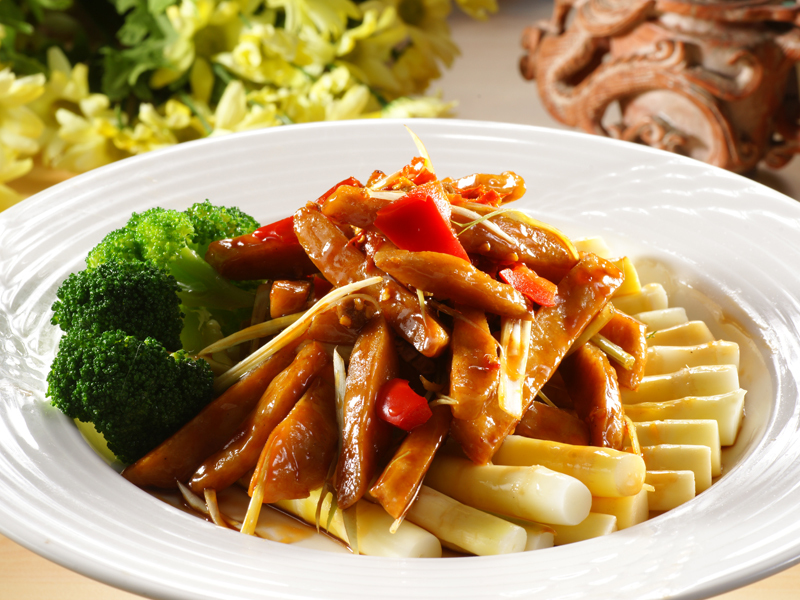 Wash bamboo shoot, broccoli and red pepper. 2. Cut off broccoli, red pepper into square pieces and cut the vegan chicken patty in small pieces. 3. Boil bamboo shoot, broccoli and add slightly salt in the water then picked up and put it in a plate. 4. Heat some oil in a pot and stir constantly the vegan chicken patty. 5. Add red pepper, ginger, black bean soy sauce, sugar, chef’s delight vegan seasoning and cook for about 1 minute. Ingredients: vegan steak, red yellow pepper, asparagus, broccoli, cauliflower, corn. Seasoning: vegan black pepper sauce, ginger, sugar, chef’s delight vegan seasoning, black pepper powder. 1. Wash and cut in pieces red yellow pepper, asparagus, broccoli, cauliflower and corn. Cut vegan steak in slices. 2. Boil broccoli, cauliflower and corn in the water for 2 to 3 minutes, then drain the water back and picked up. 3. 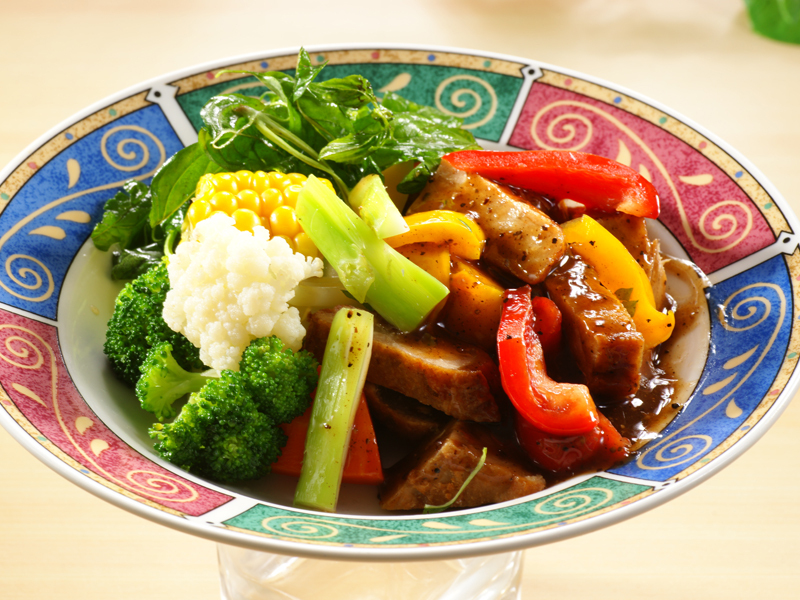 Heat oil in a pot over medium-high heat, add ginger and stir vegan steak, red yellow pepper. 4. Add some black pepper sauce and chef’s delight vegan seasoning, sugar, black pepper powder and some water, then mix it together. 5. Finally, add and stir asparagus, broccoli and cauliflower. 1. 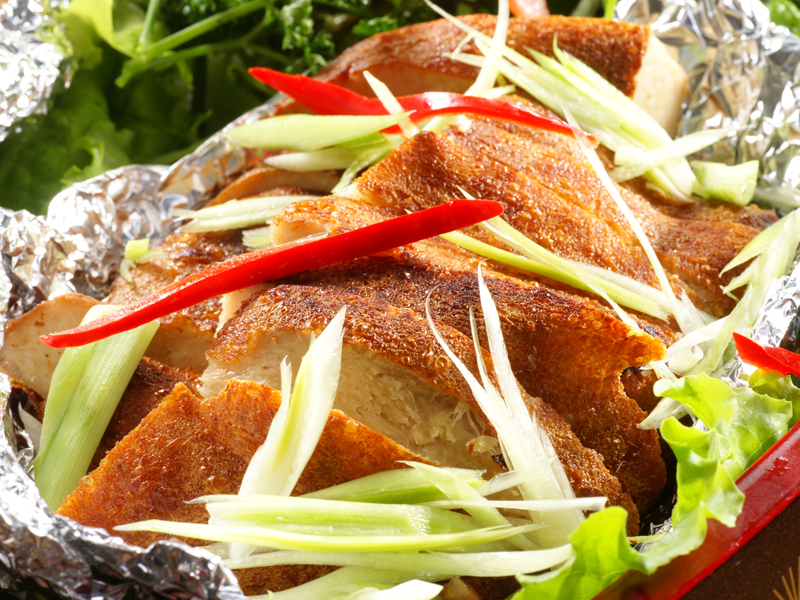 Apply vegan oyster sauce on top of the vegan chicken, set aside for 30 minutes. 2. Fried vegan chicken until golden brown. 3. Then sprinkle salt pepper on it.